The lithium batteries are designed as a replacement for the traditional Gel batteries. We offer 2 versions, as direct replacents for both the standard 50A batteries or the larger lithium battery pack to replace the larger 70A/Hr used in the Highlander models. The lithium battery is a single 24Volt battery pack, and only one is required to replace the twin battery setup of the gel batteries. 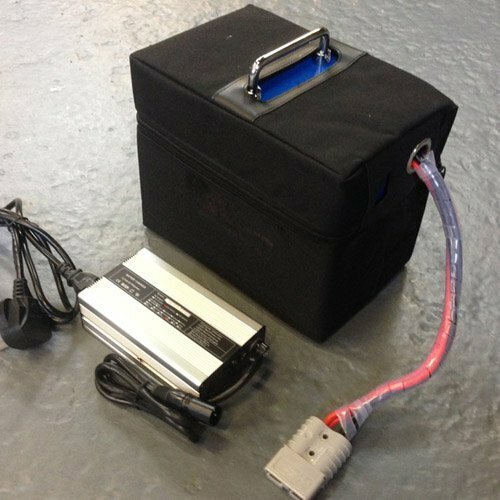 1 single lightweight battery pack, weighing only 10 Kg’s making transporting your battery effortless. Increased battery life. Typically the Li-ion battery lasts at least twice as long as gel batteries. This is backed up by a 2 year warranty.